Sykes Mitchell calls this blind on the north bank of the lower Crooked River the Best Western because it looks westerly downriver toward O’Neil Junction. Here the prevailing wind blows out of the east and the birds sweep upstream and circle to land with the wind in their wings. A single goldeneye flew low between the banks, inches from the surface of the water and set his wings to splash down in the decoys. Our guide, Todd Zaborac, leaned out of the blind and waved his arms and when the bird flushed, 15-year-old Lindsay Valentine rolled it with the first shot from his semi-auto 12-gauge. Todd sent Drago into the river. This hunt on the last day of duck season was testament to Mitchell’s first year dream of a sanctuary for wildlife along the Crooked River. Here, where the river carves a twisted course through ranch land, we staged Duck Creek Outfitters’ first annual father/son hunt. When I heard about it, I mulled over my qualifications. No male offspring, hmm. Then I decided I qualified because I am both a father and a son. Jason Taroli and Andy Fackrell joined us under similar circumstances. There were seven of us in the blind and one of our goals was to see Bill Valentine’s 13-year-old Callan bag his first duck. Last spring, Mitchell worked with the landowners to move fences to keep cattle out of the river and provide pathways for deer and elk to come down to the water. Next, he planted corn, sunflowers, milo, peas and winter wheat then brought in trees to provide shade and prevent erosion. Next, he put in the blinds and equipped them with theater seats, propane heaters and Camp Chef ovens. “The food sources for both upland birds and waterfowl are attracting more and more birds,” Mitchell said. Way out west against a lightening sky, four birds appeared in a tight knot, jinking and slipping in the wind, 20 feet over the tops of the willows. When they spotted the decoys, they were low. “Get ‘em,” Todd said. The birds flared as our gun barrels showed through the reeds that concealed our blind. Positioned at the left side of the blind, I had the most time to get ready, picked one out and swung through it, squeezing the trigger when the bead was well in front of the bird. It crashed down across the river. Taroli was next to drop a duck, a bird that dropped into the decoys and then flushed when Todd waved his arms. We watched flights of mallards, teal and goldeneye and swung and missed on several singles. “You have to lead those fast ones by about five feet,” Zaborac advised. In between groups of birds, he coached me on calling techniques. I had a new call made by Shad Harrison out of Vale, Oregon, and was able to make it speak pleasant feeding sounds. The next bird was a single drake mallard, which turned out to be the advance guard of a cloud of ducks we didn’t see until this one was over the decoys and our guns had spoken to him. 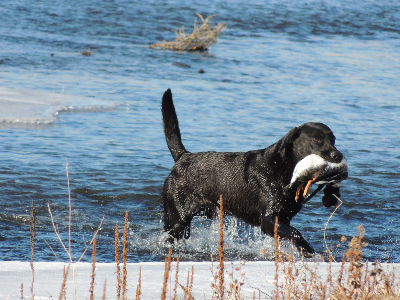 He dropped into the river and Drago dashed in for the retrieve. The rest of the flock wheeled high above us. From downriver, we heard the guns of the rest of our group and watched the skies for more. When the boys began to get restless, we contemplated a jump-shooting expedition. I wrapped their stocks with snow-pattern CamoForm to help break up the outlines of the guns. They pulled their facemasks up and their hat bills down. As soon as Todd, Bill, Lindsay and Callan left the blind, another flight of ducks swept in. When I saw them, I blew feeding sounds on my Harrison call then dropped it to grab my shotgun. We connected on two birds and marked them for Drago to retrieve. Callan had contributed on several ducks, but still couldn’t call one his own. We left the blind again and walked upriver. When we peered over a bank, birds erupted from the water in bunches of twos and fours. Callan and I swung and missed and reloaded and swung again. We lost targets in the sun and tracked them back out and one went down, a teal Drago found on the far side of the river. Drago trotted to Callan’s side and he wasn’t sure it was his, but I knew I’d missed mine. At the end of it, we had nine to our credit, not bad for a last day hunt when the birds flew like rockets under a clear blue Central Oregon sky. On the drive out, we counted honkers in the grain and looked with not a little greed upon a flock of buffleheads on the river. Even as we watched, the black and white ducks beat their wings and beat it downstream and around the corner, out of sight. “If you build it, they will come,” Mitchell had said. The proof was on the wind.